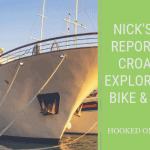 Welcome to Hooked on Cycling holiday and our cycling holiday in Italy from the Adriatic coast in the east to the Tuscan coastline in the west. This fabulous biking vacation takes you from Marche through the Umbrian hills and onto the Tuscan mountains before descending to the blue sea of the Tuscany coastline. This independent cycle tour (self-guided) has been graded as a level 3 to 4 tour for intermediate and experienced cyclists. The cycle tour will take you from medieval hilltop village to village always in view of stunning landscapes. Leave the wonderful views of the Adriatic Sea and enter the rolling hills. The magnificent medieval and renaissance town of Urbino await you full of architectural and artistic masterpieces. On your ride visit of Mondavio and the Duke of Urbino Palace. Today continue cycling with views of towns and countryside to the beautiful medieval town of S. Angelo in Vado. Today you cycle the long climb to Bocca Trabaria pass but it is followed by a wonderful descent to the Upper Tiber Valley. Optional loop day on the 10 night tour. Today you have an epic ride across the pre-Apennines Mountains that separate the Upper Tiber Valley from the Chiana Valle. Great views as you descend to Cortona on Lake Trasimeno and Chiana. Now you are in Tuscany where your cycle ride today is to Montepulciano one of the most beautiful hilltop towns of Italy known since old times from its prestigious Vino Nobile wine. Maybe your chance to taste some wine. Optional loop day on the 10-night tour. A fantastic ride on the slopes of the ex-volcano Mt Amiata passing through olive groves, durum wheat fields to chestnut woods of Amiata. Today you will cycle the wonderful descent from the slopes of Mt Amiata to the remote Maremma, a rural area once the core of the Etruscan Territories. You can also soak in the hot springs of Saturnia. Today a more relaxing easy ride in the flatlands of Maremma to the scenic promontory of Mt Argentario in front of the Tyrrhenian Sea. Your tour is now complete and you have cycled the Italy coast to coast!